Dinner Saturday night included two whole can chickens. 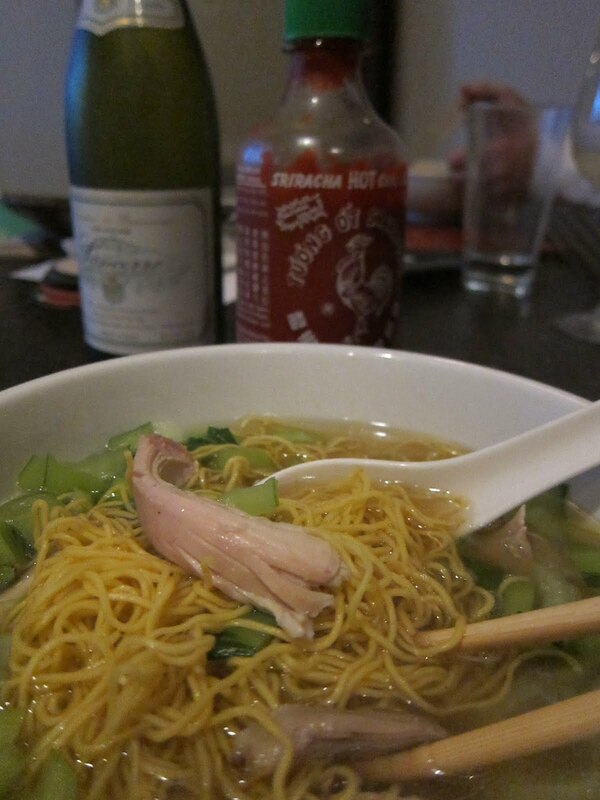 We had a small amount of meat left and all those bones–perfect for us to make a rich chicken stock for a Sunday supper of chicken ramen noodle soup. I follow the basic recipe for making chicken stock and use a crockpot. The soup could not be more simple: make noodles; heat chicken stock and simmer with chopped bok choy for a few minutes; add leftover chicken; add cooked noodles; serve; enjoy. Cook in crockpot on high for 2 hours. Let sit and skim fat from top with a spoon. Strain broth with a cheesecloth and serve immediately or transfer to a glass jar or bowl and refrigerate for use later in the week. Cook noodles and drain. Simmer chicken stock and add bok choy to blanch. Add chicken and cooked noodles. Serve.